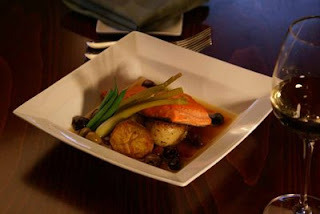 August 28, 2008 - A "new" salmon, the Yukon River keta, or chum, is making a splash with Seattle chefs and is finding its way to select national markets. Like the much-heralded Yukon River king salmon, Yukon fall chums (Oncorhynchus keta,) are genetically programmed to store oil for their 2,000-mile journey to spawning grounds. "They have unique spawning requirements of upwelling deep spring water found in only a few places in the upper portion of the drainage so the majority of them have a body condition to enable them to swim a long distance," says Fredrick Bue, a biologist with the Alaska Department of Fish & Game. The fish are supplied by community-owned Kwik'pak Fisheries in Emmonak, Alaska, the only Fair Trade Federation fishery in the world. Sales directly benefit communities in dire need. Without a king salmon fishery this season and with fuel prices exceeding $7 a gallon, the people of the Yukon River Delta villages are facing a rough winter. "Getting this Yukon fall chum into top restaurants and retail markets will make a big difference," says Jack Schultheis, Kwik'pak Fisheries general manager. "Yukon River chum is not your run-of-the-mill chum," Jeremy Anderson, director of operations for Seattle's Consolidated Restaurants, told SeaFood Business for the September One on One column. Anderson is currently menuing the fish at Elliott's Oyster House. Recent lab tests conducted by Bodycote Testing Group in Portland, Ore., show that Yukon fall chums contain 14 to 19 percent oil. Chums generally have the lowest oil content of any salmon species, but the Yukon fall chum has more oil than cohos, sockeyes, pinks, more than three times that of most chum salmon and even more than king salmon from most rivers. After a summer of record salmon prices, consumers will be pleased with the attractive introductory pricing of the Yukon fall chum/keta salmon, says Kwik'pak Fisheries. "While this fish is in a league by itself, we still have to compete with inexpensive chums from other areas, so we are keeping the price affordable. Once people try it, many say, 'That is the best salmon I've ever eaten,'" says Schultheis. "It makes an excellent alternative to king salmon, which have been scarce and pricey this year - and it actually has a higher oil content than the typical king. The Yukon fall chum is like discovering a whole new salmon species. In the words of one retailer, 'It's a different fish!'" The ADF&G forecasts up to 600,000 fish for the fall run. The fishery, like all Alaska salmon harvests, is certified as sustainable by the Marine Stewardship Council. Yukon fall chums should be available into September.